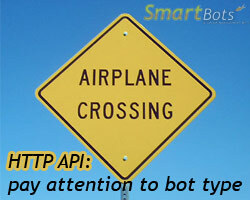 Some SmartBots HTTP API commands work with a specific bot type only. For example, avatar_groups command works with Standard bots and can not be used with Model bots. This is because of resources these commands consume: Model bots are light-weight and can’t carry heavy commands. The required bot type can be found in SmartBots documentation (see avatar_groups as an example). If you are using a bot of a wrong type, system sends you an IM asking to update your bot. The update procedure is easy and described here.